Northern Lights Credit Union wants to do its part to make retirement more affordable; after all, you've Earned It! If you are 62 years old, or older, you can enjoy all of the benefits of our Premier Checking Account at a reduced monthly average collected balance of $1,500. A checking service like this means spending your heirs' inheritance couldn't be easier! You pay attention to the market losses instead of your long-term needs. Catastrophic events and long-term health care needs cause as much damage when you’re caught unawares as does a shaky stock market. Will your nest egg be able to handle the costs of long-term care? You forget about inflation and taxes. Your retirement savings is a lot smaller than you think it is when you start factoring in the rate of inflation and the taxes you’ll have to pay when you start drawing out of it. Again, experts say a volatile market isn’t your portfolio’s greatest risk. Inflation and taxes may be. You indulge instead of save in the last years before retirement. Just because you’ve got just a handful of years left before you retire doesn’t mean you should go ahead and buy that new Lexus. Some people are able to build up almost a third of their savings in the last five years of retirement because they got serious about saving and investing. You think you can withdraw more than you really can. If you rely on average annual returns on your investments to determine just how much you can withdraw, you could be drawing down your retirement fund faster than you should. Average returns are seldom steady. A safe rule of thumb is to count on a 3 percent rate of withdrawal. You don’t think you’ll live a long life. Despite the dramatic rise in life expectancy, people still seriously underestimate how long they’ll live. If you’re not thinking about longevity, you could tap out your savings much faster than you should. You can feel the panic. Retirement is just around the corner and you haven’t saved anywhere near enough. Now you face the prospect of scraping by on just Social Security, perhaps with a small pension. Worse, you face the prospect of running out of money. This isn’t how you dreamed of retiring. Now what? It’s never too late, according to CERTIFIED FINANCIAL PLANNER™ professionals. Here are a few pre-retirement and post-retirement planning ideas that can help you salvage your retirement dreams. Prepare written budgets. Budget for pre- and post-retirement. This injects a dose of reality into your financial planning and helps you plan the following strategies. Rethink retirement. Do you really want or need to retire soon? This isn’t a cop-out. Our concepts of retirement are changing rapidly. Some experts point out that age 62 or 65 can be an early age to quit working when people routinely live to age 80, 85, or 90. Consider retiring in stages, working full time longer, then transitioning into retirement by working part time. Every year longer that you work — and save for retirement — will significantly improve your financial nest egg and reduce financial needs for the time you are fully retired. Think of it this way: would it be better to work two or three years longer in the job you’re in now, or have to find another job after you retire when you discover you don’t have enough money? Avoid “lifestyle creep.” It’s not uncommon that in the last five years before retirement, when the kids are gone, the mortgage and college are paid off, and employment earnings are at their peak, that people boost personal spending with cruises, country club membership, even an expensive new home. The problem is that not only are you diverting money from retirement savings, you are simultaneously increasing the cost of retirement assuming that you want to maintain that pre-retirement lifestyle once you retire. For example, say you take the extra money from increased earnings and reduced child-rearing expenses and put half of it into retirement savings and half into improved lifestyle. If this increases the cost of your lifestyle by one-third, the other half of earnings and savings will increase your retirement nest egg by only eight percent. Reduce expenses. Try shaving 10 or even 15 percent from your living expenses. If you don’t have enough money when you retire, you’ll be shaving expenses then, anyway. Better to do it before retirement and put the savings into your nest egg. Many households have “lazy” debt such as high-interest credit cards or a home that could be refinanced. The budgets will help you here. Maximize retirement plan contributions. Once you maximize those vehicles, consider tax-deferred annuities, which have no contribution limits, or growth stocks, which don’t kick out current taxable income. Consider extra contributions to retirement plans. The contributions won’t qualify for a tax deduction, but the earnings will grow tax deferred. Review investments. You don’t want to invest too aggressively so soon before retirement, but you may not want to have all your investments in low-risk (and thus lower-earning) accounts, either. Most planners recommend that even retirees have some portion of their portfolio in stocks. Moonlight. It’s usually better to work an extra job before retirement than afterwards. The money you make can then work for you by being invested, perhaps in a tax-deferred account, resulting in a larger nest egg. Consider delaying Social Security. For every year beyond your normal retirement age and age 70 that you can delay taking Social Security benefits, the size of the monthly benefits that you eventually collect will increase. However, this may not be a good strategy for people with shorter-than-normal life expectancies. Make use of your home. Move to a smaller, less expensive home, and invest the profits. Rent out a room for extra income. Consider a reverse mortgage. Withdraw from the right accounts. 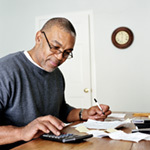 Often you can stretch your retirement savings by withdrawing first from the right accounts. Typically, this is taxable savings, which allows tax-deferred accounts to continue to grow faster, but not always. A Roth IRA conversion might make sense. Review your options with your financial advisor. How much will I receive in Social I'm retired, how long will my savings last?Security?